Learn how to use the Course Search & Enroll app. Choose your courses for a term, select your preferred sections, and enroll, swap, drop, or save courses for later. Discover the different ways to filter your search, view details of course sections, and link to the Schedule Planner tool. This page has been replaced. Please go to registrar.wisc.edu/enrollhelp for updated and current information about the Course Search & Enroll app. Problems with the Course Search & Enroll app? Office of the Registrar. — Please contact us to resolve problems with enrolling in classes, error messages, and to report issues with the software: registrar@em.wisc.edu and 608-262-3811. DoIT’s Help Desk. — Contact the Help Desk to fix problems with MyUW or your browser. Log into http://my.wisc.edu and open your Academic Navigator to launch the Course Search & Enrollment app. Find UW–Madison courses offered in a specific term. Before searching, choose a term (semester). Clear all the filters with the “Reset search” button. Choosing “All” for the term filter shows all the courses that can be taught at UW–Madison, regardless of term. 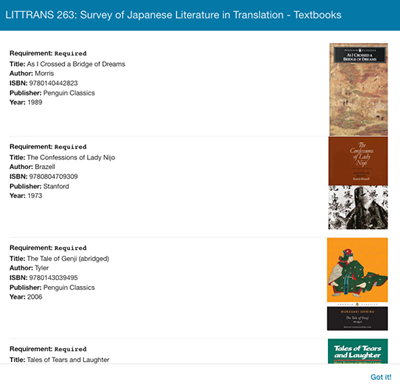 This filter won’t display individual sections for a course, since these vary from term to term. The app will show any term that is currently open for enrollment. You can also choose a term in the My Courses tab. 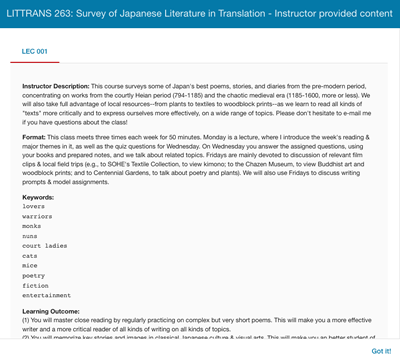 Type a keyword, to find matches in course information (keywords include: subject area, course title, descriptions, instructor-provided content, etc.). The Enroll app finds both exact and approximate matches: When you search for “culture,” the results list courses matching “culture,” “cultural,” and “cultures,” among other results. “Game” shows more results than “games,” because it is an approximate match to more keywords. Search for courses taught by a specific instructor by using their last name as a keyword. Search results may include courses that match the search term in other fields. The results when searching for “Nelson” may include Prof. Adam Nelson and Asst. Prof. Nicole Nelson, but also courses that include “Nelson Institute for Environmental Studies” in the description or details. Searching for last names that have more than one word (e.g., Prof. Lyn Van Swol) or are hyphenated (e.g., Prof. Mario Ortiz-Robles) may produce many results because of the approximate word matches. Try searching for just one part of their name instead (e.g., “swol” or “ortiz”). Number searches can include a course number (e.g., 277 or “POLI SCI 277”) or a date (1865). This works with or without a term in the search-text field. UW–Madison academic departments and programs offer courses are grouped by subject areas. Sometimes these have the same name (the Department of Philosophy offers courses in the Philosophy subject area) and sometimes they are different (the Department of History offers courses in History and also in History of Science). Subject areas are also abbreviated in course titles, such as PHILOS, HISTORY, and HIST SCI. The default setting will find courses that have “Open” and “Wait listed” sections, and display only those sections. The Enroll app looks at seat availability in real time. Your search results may change as sections fill. 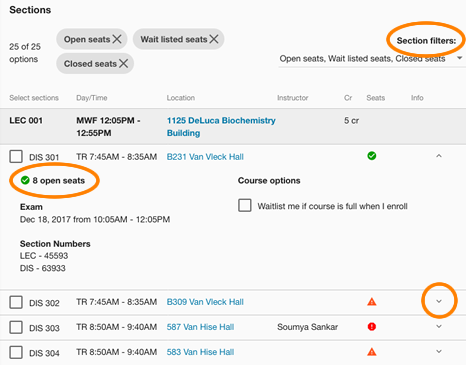 “Add by class number” lets you directly add a course’s sections to your Cart by using its unique five-digit class number. The course will be added to your Cart. You may still need to select a specific section before you enroll, even if you entered the class number of a discussion or lab. Class numbers are displayed in a course’s Section Detail within the Section Panel (look for the five-digit number labeled “Section Number”). Find courses that meet UW–Madison’s General Education Requirements for undergraduate degrees. Communication Part A and B. Select either “Communication A” or “Communication B;” selecting both will show combined results of all courses that meet a Communication requirement..
Quantitative Reasoning Part A and B. Select either “Quantitative Reasoning A” or “Quantitative Reasoning B;” selecting both will show combined results of all courses that meet a Quantitative Reasoning requirement. Ethnic Studies. Choose this checkbox to display courses which satisfy the Ethnic Studies requirement. 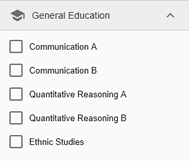 This checkbox can be combined with the Communication or Quantitative Reasoning checkboxes, although usually the campus offers courses that meet only the Communication B requirement combined with Ethnic Studies. How General Education Requirements are displayed. When a course will satisfy the Communication A requirement, for example, any of its sections will satisfy that requirement. These courses usually display this requirement at the course level. Communications B is sometimes assigned to a few individual sections of a course. When viewing individual sections, look for the school symbol to find those that meet a General Education Requirement. 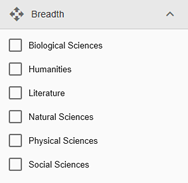 The Breadth General Education Requirements checkboxes can be selected individually (e.g., Humanities) or in combination (e.g., Humanities and Social Sciences). Combinations will show all courses that meet any of these requirements. This filter finds courses that match the Elementary, Intermediate, and Advanced depth designations that some degrees require. Find sections that can help you earn Honors credit. When viewing individual sections, look for the book symbol. Each term (Fall, Spring, Summer) has sessions with different class start and end dates. The majority of UW–Madison courses in the Fall and Spring are scheduled over a “Regular” session. This filter lets you choose from specific sessions offered during the term that you have selected. 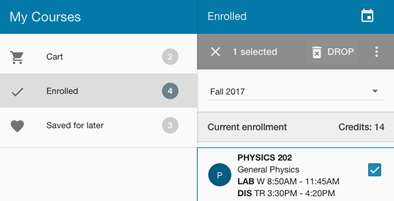 If a course is scheduled for a session other than “Regular,” the session dates and three-character code will display in the Sections Panel. 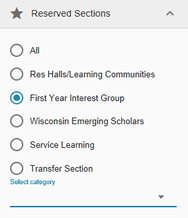 Search for courses or sections that are offered exclusively to specific groups (like students who transfer to UW–Madison from another school) or which have special qualities (like offering 25 hours of service learning outside the classroom). The types of groups displayed may vary from term to term, depending on what courses are offered. There are two fields in the Reserved Sections filter, and both must be set for this filter to work. Then, in the lower drop-down, select a specific item. Choosing “Res Halls/Learning Communities” in the top list will show names of residence halls and learning communities in the lower list. Choose one, like “Sullivan Hall,” to find courses reserved for students in this group. When viewing individual sections, look for the star symbol to find those that have Reserved Section. Use the Credits filter to search for courses offering a specific number of credits. Searching for “1” to “1” credit shows all one-credit courses. Leaving a field empty or unselected means “anything to this point.” Selecting “5” in the first field and leaving the second field empty will match any courses with 5 or more credits. Leaving the first field empty and selecting “3” in the second field will match any courses with 1, 2, or 3 credits. 50% Graduate Coursework Requirement. The “50% Graduate Coursework Requirement” filter finds courses that fit this Graduate School requirements. 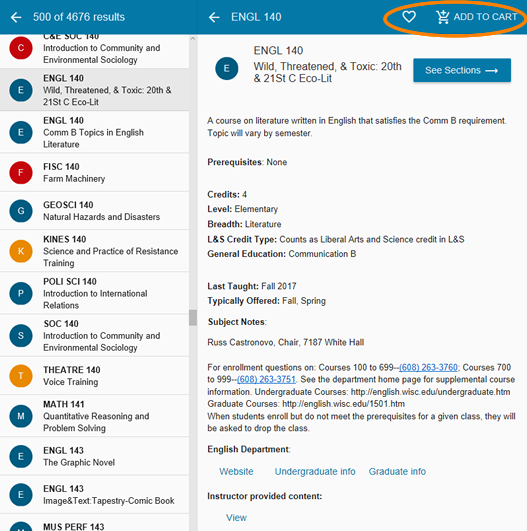 UW–Madison offers many courses with sections that are fully or partially taught online; these can be found using this filter. The Enroll app will show a maximum of 500 results per search. Each course is listed by its abbreviated subject-area code, and the course number. Cross-listed courses, those offered under more than one subject area, are shown as separate courses in the Enroll app. There is no indicator to identify cross-listed courses. The colored circles correspond to UW–Madison’s schools and colleges, but the color isn’t otherwise significant. 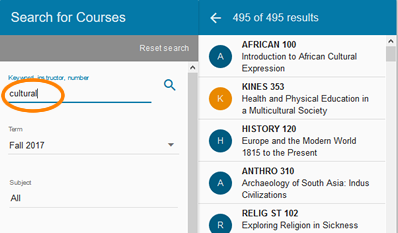 Select any course from the Results panel to show its information. The Course panel displays standard details about each course, including its official description, number of credits, and if it meets any General Education Requirements. Some courses have much fuller descriptions, including reading lists and links to course web sites, in the “instructor-provided content” linked in the Sections panel. Many courses have “prerequisites” listed, or requirements that must be met before you can enroll in that course. The Prerequisites field may also list other rules about the course, perhaps related to the number of credits earned, or which sections have an Honors option. Courses will also have “Subject Notes,” general information posted for all the courses in that subject. At the bottom of the Course panel is a link to the website for the department that presents courses in this subject area. There may also be links to more information about this subject area in the Guide, which is the master record of all UW–Madison’s courses, degrees, and majors. If you are interested in this course, select add_shopping_cart to add it to your Cart. Courses need to be in your Cart before you can enroll. 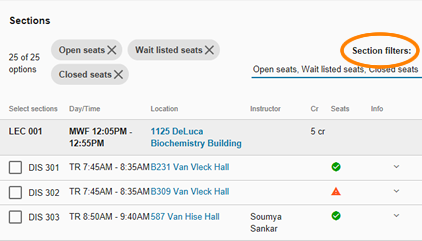 If you plan to enroll in the course, you will eventually need to select specific class meetings, known as sections (lectures, seminars, discussions, labs, etc.). Add a course to your list of courses that you might want to take in a later semester. 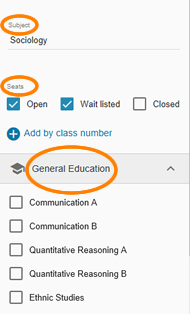 Select the blue “See Sections” button in the Course panel to view the term-specific details for that course. seminar (SEM; a smaller class with more intensive discussion than a lecture). When a course is made up of more than one kind of meeting (like a lecture, plus a discussion, plus a lab), these sections are arranged in specific combinations for enrollment. Certain discussions will be associated with certain lectures. A lab may be matched with one particular discussion. You enroll in these preset combinations. Before you can enroll in a course, you select the specific class meeting times, or sections. Some courses have just one section. Others may combine a lecture for many students, a smaller discussion group, and a lab that meets in a workspace with special equipment. When you select sections for a course, the section number, dates, time, and location will display in the upper part of the Sections panel. The Honors and Reserved section filters require at least one Seats filter to be selected. If you don’t see all the sections that you expect, make sure that the filters are set to what you want, and that you are searching in the correct term (Fall, Spring, Summer). Open more information about each section by selecting the down arrow on the right end of the section’s row or the checkbox on the left side of the row. The Enroll app shows a real-time view of whether the course is open check_circle, waitlisted warning, or closed check_circle. When a section has open seats, the section details will show how many seats are remaining. View the specific student group that this section is reserved for by selecting this link. Some courses will display additional information under “Class notes,” such as whether the course meets with another course. When instructors have submitted a list of textbooks for their course, that list will be viewable through a link in the section details. You can also view your course’s textbooks in the “My Academics” section of Student Center. Week-by-week summaries of the course, announcements of special events or projects, and richer descriptions of the course itself might be found in the “instructor-provided content” link. If you see this link active in the section detail, explore it to find out more about what the instructor is developing for this course. Remember to select the checkbox to the left side of the row if you want to add a particular section to your Cart. Checking any of the options described below won’t automatically also select the section. Select this checkbox if you’d like to enroll in this course’s Honors option. Some courses are set up to have a wait list when the section is fully enrolled. Select this checkbox to automatically be added to that section’s wait list if the course is full at the moment that you try to enroll in it. Some courses are offered at different credit amounts, depending on activity like participating in an optional discussion section, completing Honors work, having graduate-student status, etc. Some course require special permission before you can enroll. Please contact the department offering the course with your request. Most often, if you have been given permission to enroll, a settings change will be made by the department and then you complete enrollment as usual. In some cases, the department will give you a permission number. Enter this number in the section details and then complete enrollment as usual. 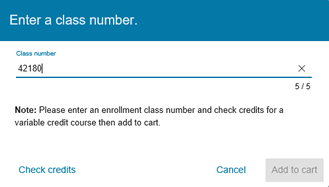 Each specific class has a unique five-digit number (displayed as “Section Number” in the Enroll app). When a lecture, lab, and discussion make up the whole course, each of those three sections will have their own five-digit class number. These class numbers can be used to search for a specific section, using the “Add by Class Number” feature in the Search filters. Before you enroll, confirm that you are working in the correct term (semester). The My Courses tab keeps your lists of selected and saved courses, and is where you will enroll, drop, or swap courses. You can also link to the Schedule Planner software to plot out your best weekly schedule with the courses that you plan to take. As you added courses to your Cart (from the Search tab), the campus’s enrollment system has checked that you are eligible to take these courses. When there is a reason why you can’t go forward with enrollment, you’ll see a validation message to help you make a change. Common situations include not meeting the prerequisites for the course, needing permission to take the course, or exceeding the number of credits allowed in the term. If one or more of the courses in your Cart has a validation message, you’ll see a little indicator next to the Cart icon at the top of the app. Hover over the course in the Cart, and select the checkbox that appears. Open the three-dot expandable menu in the gray bar that opened above your Cart list. Choose “Remove,” and confirm this action in the next dialog box. Another way to remove courses from your Cart is from the My Courses sections panel. While viewing the section details for a course, open the three-dot expandable menu on the blue bar above the section details. Choose “Remove from Cart” and confirm this action in the next dialog box. The checkbox in the Cart needs to be unselected for this to work. 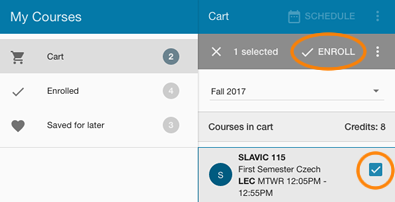 Before you enroll, you can use the Schedule Planner app to compare different weekly schedules of sections in your Cart courses. You can also add in blocks of time (“breaks”) during which you don’t want any courses planned, reserving time for a job, student clubs, sports activities, etc. Select the SCHEDULE button to open Schedule Planner in another browser tab. Schedule Planner imports the courses in your Cart, ignoring any validation messages. If you have already added courses to Schedule Planner, that tool will not import your Cart. You’ll need to add those courses manually in Schedule Planner. Schedule Planner isn’t aware of sections (like a specific discussion) that you’ve already selected in the Enroll app. It will import the course from your Cart, then you’ll need to reselect that section within Schedule Planner. Make note of the three-digit section numbers (like DIS 309) of any sections that you want to “lock” into Schedule Planner’s course combinations. After choosing your preferred combination of sections, Schedule Planner will add (or update) these sections in your Cart. Ready? You can enroll in one or more courses at a time. Hover over the course in the Cart, and select the checkbox that appears. Select the “ENROLL” button in the gray bar that opened above your Cart list, and confirm this action in the next dialog box. Another way to enroll is from the My Courses sections panel. Select the “ENROLL” button above the section details, and confirm this action in the next dialog box. The checkbox in the Cart needs to be unselected for this to work. 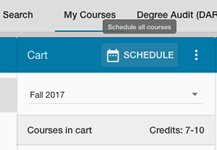 To enroll in all courses in your Cart, open the three-dot expandable menu in the blue bar above your Cart list. Choose “Enroll all,” and confirm this action in the next dialog box. View your successfully enrolled courses in the Enrolled list. Swapping a course replaces one of your enrolled courses with one from your Cart. The swap process confirms that you were able to get into the new course, before dropping your enrolled course. Hover over the course in the Enrolled list, and select the checkbox that appears. Open the three-dot expandable menu in the gray bar that opened above the Enrolled list. Choose “Swap course,” then choose the courses you want to swap in the next dialog box. Another way to swap courses is from the My Courses sections panel. Open the three-dot expandable menu on the blue bar above the section details. Choose “Swap course,” then choose the courses you want to swap in the next dialog box. The checkbox in the Enrolled list needs to be unselected for this to work. Dropping a course means you will no longer be enrolled in that course. Hover over the course in the Enrolled list, and select the checkbox that appears. Select the “DROP” button in the gray bar that opened above the Enrolled list, and confirm this action in the next dialog box. 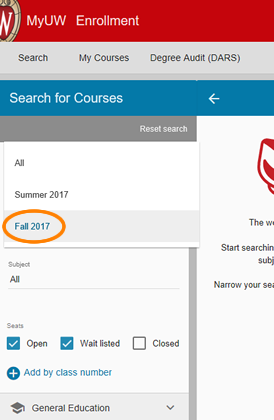 Another way to drop courses is from the My Courses sections panel. Select the “DROP COURSE” button above the section details, and confirm this action in the next dialog box. The checkbox in the Enrolled list needs to be unselected for this to work. Select the event icon to open the My Courses widget in MyUW. The My Courses tab here is different than the My Courses widget in MyUW. Read more about the widget. View all the courses that have you on a wait list for your selected section. Students can be on up to three wait lists per term. To enroll: When you’ve received notification from a course’s department that a seat is open for you, select that course from your Wait List courses list. Follow the same instructions as for enrolling in a course from your cart (see above). When courses are dropped before the start of the term, they are not displayed in the Course Search & Enroll app. 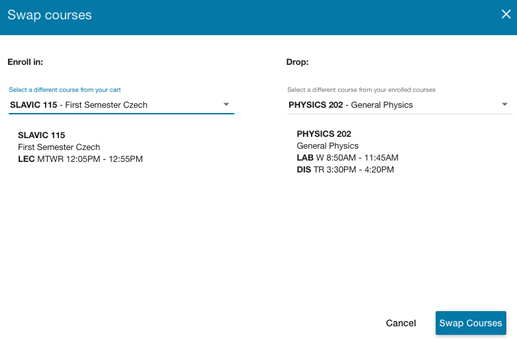 After the start of the term, dropped courses will display in a “Drop” list under the My Courses tab. View all the courses that you’ve added to your Saved for later list. 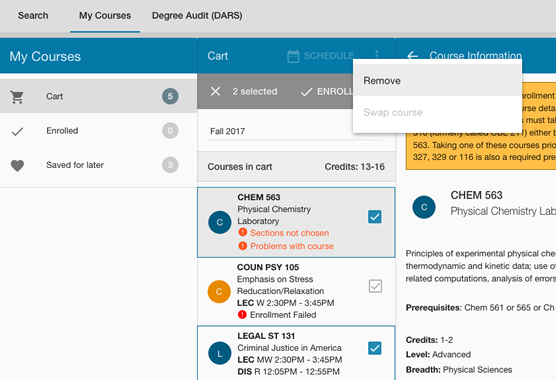 Unlike courses in your Cart and Enrolled lists which are for a specific term, courses in the Saved for later list are viewable no matter what term you’ve chosen. This is why no section details (e.g., class meeting day and time) are displayed for Saved for later courses.